Sometimes you get lucky and money just lands in your lap. Other times, you have to work your way up from the bottom before you can reach the top. Ted Williams has hit the bottom and now, thanks to the power of an amazing voice, he’s finding his feet and reaching for the stars once more. 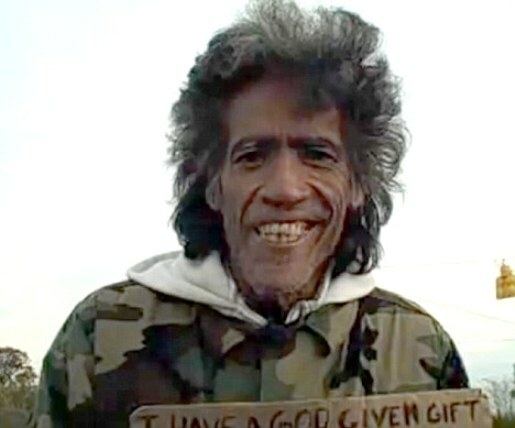 Ted Williams is a homeless man with the most amazing voice you’ll ever hear. Williams, dubbed Radio Man by the police officers who’d chase him away from his panhandling corner, went to school for radio before his life got derailed by drugs and alcohol. While he lost his home and job, but he never lost that amazing voice. He’s like a homeless Don LaFontaine, if Don was still alive. More importantly, he’s got two years of sobriety under his belt and thanks to the viral fame afforded him by YouTube, he’s getting job offers left and right, including one from the Cleveland Cavaliers that comes with a phone and a house.